2016 Topps Allen & Ginter X Baseball returns as an online exclusive with one autograph per box. The offshoot release offers a different format and signed cards that are not found anywhere else. Borrowing from the regular 2016 A&G design and checklist, 2016 Topps Allen & Ginter X Baseball is largely the same but adds exclusive Autographs to the mix. While specifics were not provided, the listing teased a black mini autograph that is not framed. Every box contains one of these autographs. The 2016 Topps Allen & Ginter X set also promises that "parallel cards are flooded back, just like they were in 2015 (A&G X)." The 2015 set included black base cards and silver mini parallels. 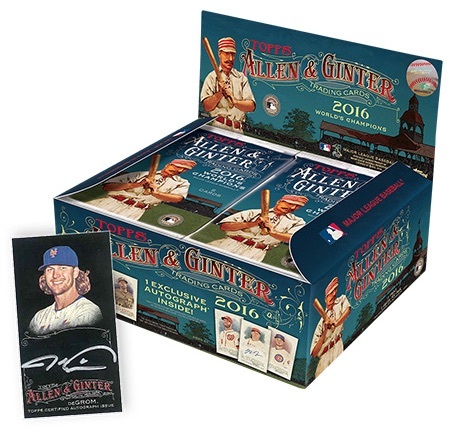 Only found at the Topps Online Store, 2016 Topps Allen & Ginter X boxes are now available with pricing of $69.99. 18-box cases are also an option for $1,250. We will update the 2016 Topps Allen & Ginter X page with more information as it is revealed. The checklist provided was the entire list from the main A&G set. This will be updated as more information is revealed.